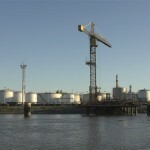 The important Esso refinery operates around the clock and has 4 berths in use which are, from West to East, piers C, H, G and E. Both crude and petroleum by products, including petcoke, are handled. Reported depths at datum of between 8,25 to 10,40 m (27 to 34 ft) berths C, E, and H, and 6,00 m (20 ft) berth G; berthing is portside to jetty in all cases. Berthing/unberthing at night usually but not always allowed, as per PNA judgement. Fresh water available at all berths. Bunkering permitted by pipeline only. Reinforced concrete platform on piles, 129 m length, vessels berth on 8 dolphins. Can operate with crude, fuel oil, gas, diesel oil, naphtas. Pipelines 2×10´´, 7×8´´, 2×6´´, 1×4´´, 1×2´´. Built of reinforced concrete, 16 m long, vessels LOA 40 to 220 m berth on 7 dolphins. Handles liquid cargoes similar to Pier C. Pipelines 2×10´´, 5×8´´, 4×6´´, 3×4´´, 1×2´´. 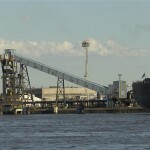 In addition, berth is equipped to load petcoke from a loading tower which is stepped onto the dolphins. The tower is fitted with loading arm with chutes at extremities and which are swung out over the loading vessel. Loading arm can rotate through 70º horizontally and 35º vertically, outreach 30m. 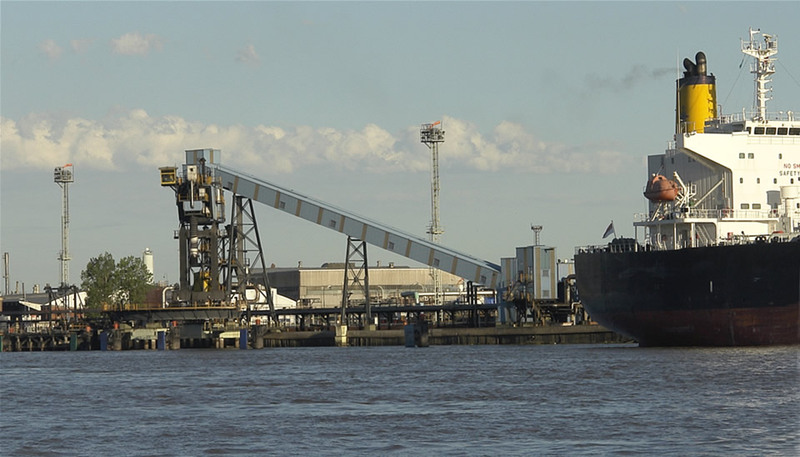 Vessels loading petcoke should have a beam not exceeding 30 m.
Loading is by one conveyor belt and a chute requiring vessels to shift to place loading hatches under the chute. Loadrate about 500 TPH. Depth alongside 10,40 m.
Built of reinforced concrete on wooden piling, length 50 m, with 2 berthing reinforced concrete dolphins. Cargo operations are similar to Pier C. Pipelines 2×12´´, 8×8´´, 7×6´´, 4×4´´, 1×2´´, . Depth alongside about 8,25 m .
PIER G (INTAKE 0/ZERO): Built of reinforced concrete. Length 10 m. Cargo operations similar to other berths. Pipelines 2×10´´, 7×8´´, 2×6´´, 1×4´´, 1×2´´.